Adorable card Pat. Loving those flowers. A really lovely creation and such pretty colours Pat. Pretty image and papers, beautiful design...I LOVE those delicate flowers! OH SO CUTE Pat! Love those flowers and your overall design is fabulous! What a sweet & beautifully colored image! Thanks so much for joining in the fun at our Double D ‘Simply Gingham’ challenge! We hope you’ll come back often. This is so sweet, Pat. 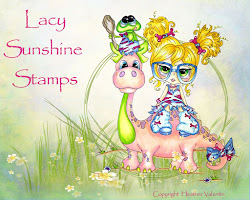 I love this adorable image, your choice of papers and all your lovely embellies. Awww! This is so cute!! Thanks so much for playing along at Double D!! Gorgeous card, lovely image and l like those flower dies you have used. Very cute card Pat! Good luck in the Little Red Wagon challenge this week! Utterly adorable! Love the mix of gingham and flower sprigged papers, and those die cut flowers are so pretty. Add the fence and the corner die cut and you've got an amazing card! Thanks for playing along with us at Double D! 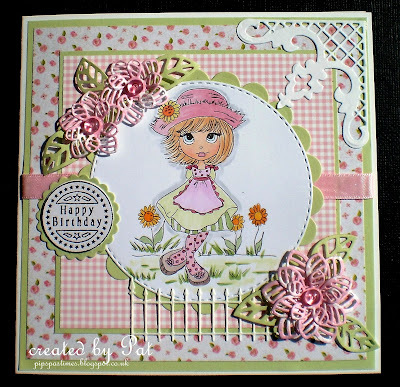 Hello… Thanks for joining our ‘Green, White & Pink’ colour challenge with your lovely card. Good luck and hope you can join us again for our next challenge. Thank you soo much for taking part in our "pink, green, white” colour challenge over at Crafty Friends. Beautiful and adorable card...love those flowers, too! Thank you for joining our Double D challenge! I love this card - most of all the design work is incredible! The papers and design elements are perfect. Beautifully done Sugar!